This beverage menu for vegetarian, it’s diet beverage and make you relaxing and good for health. That smoothie is delicious for everyone. 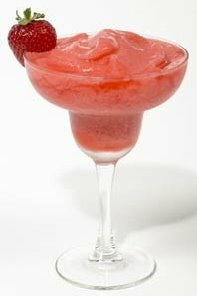 In blender combine all ingredients except whole strawberry and lime slice; blend smooth. Pour into stemmed glass rimmed with salt or sugar (see below). Garnish with a whole berry and a lime slice. NOTE: To create a salt or sugar-rimmed glass, take a lemon or lime wedge and rub the drinking surface of the glass so it is barely moist. Dip the edge of the glass into coarse salt or sugar. Non-Alcoholic Version: Omit tequila and Triple Sec. Add an additional squeeze of lime juice. Enjoy your cocktail for good your health is a wonderful beverage.